These bikers are riding illegally under French law. They should queue up in lane like all other vehicles! 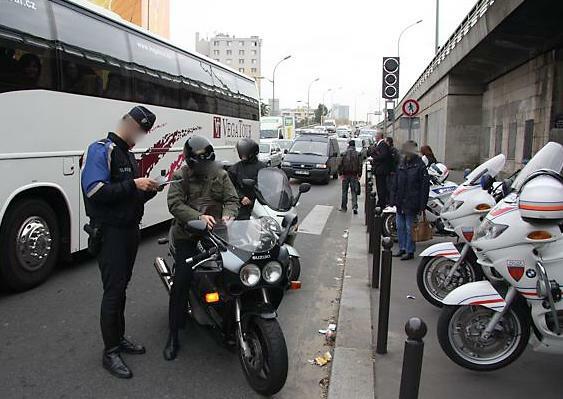 In the last few weeks, the Police have been specifically targeting bikers on the Paris ring road (“Peripherique”) by issuing them with expensive fines (90 euros minimum if paid promptly) and taking three points off their licence if caught filtering through stationary or slow moving traffic. Thousands of motorcyclists, whether scooter or motorbike riders, have been forced to contribute to the French Government’s wealth as a result of the authorities continued refusal to make traffic filtering (or lane splitting) legal for all bikers in France, while this practice is either legal or largely accepted in all other member states of the European Union, including the United Kingdom. In France, where motorists must drive on the right hand side of the road, the Highway Code prohibits a vehicle from overtaking another on the right, which is specifically what traffic filtering does when motorcyclists ride in between lanes. 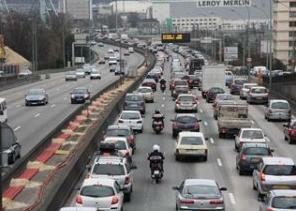 The French Highway Code treats motorcycles and cars in exactly the same way when it comes to overtaking. Under no circumstances a vehicle is allowed to overtake on the right. Despite enormous national demonstrations organised by the Fédération Française des Motards en Colère (FFMC – French Federation of Angry Bikers), the authorities still refuse to listen and continue to shut their ears to any proposal that consists of making traffic filtering legal for motorcyclists. Bikers represent honey pots for the French authorities who have recently instructed the Police to issue as many fines as they possibly can to bikers caught filtering through stationary or slow moving traffic. To maximise the number of fines issued to bikers, the Police have been employing nasty dirty tricks on the Paris peripherique, which consist of deliberately slowing down the traffic by driving their own cars and vans at a reduced speed in an attempt to take advantage of the bikers’ desperation in slow moving traffic and catch them filtering between lanes. A couple of Police cars or vans squeeze in between cars, slow down the traffic and a few cops further down the road stop all bikers seen filtering through traffic and issue each with a nasty fine and three points off their licence. This is pure racket and unfortunately represents the horrifying truth of how bikers are treated in France. Further down the road, bikers who have been encouraged to filter through slow traffic created by Police cars and vans, are stopped and fined... RACKET! Can you imagine, as a biker, how frustrating it is to be forced to stay stuck in traffic although there is plenty of space for you to move forward and still make it to your destination on time? The FFMC has issued excellent guidelines on how to safely filter through traffic and submitted them to the French Government for approval, but still with no luck. As a result, the FFMC has decided to intensify its actions against the authorities and the Police and will be organising another enormous protest gathering thousands of riders in Paris on 26th March 2011, to say enough is enough. The protest will initially take place in strategic locations across the French capital with bikers split in groups. The groups will then join to create an enormous convoy and descend en masse onto the peripherique with each bike taking the same space as a car and leaving plenty of space between riders to once again demonstrate to the authorities that if not allowed to filter, bikes can massively congest and cause complete chaos on the roads, as cars do. UK France bikers.com calls all Paris based riders to join the protest on 26th March 2011 to express their disgust at the recent Police money-grabbing dirty tricks. We also urge all UK riders who can make their way to Paris to come and support their French brothers and sisters in their fight against their Government. Let’s not forget that the FFMC has recently and generously given 720 euros to their UK fellow bikers to help fund the court case against Westminster City Council’s bike parking tax in London, so why not come and support the FFMC on 26th March 2011 in return? Protestors will meet at Chateau de Vincennes in East Paris at noon for a 1pm departure (don’t forget that France is one hour ahead of the UK). This was written by a biker, no doubt. Riding in between cars and not obeying the lanes is extremely dangerous. It is illegal for a reason and should be enforced to the maximum. Motorcyclists must obey all traffic rules or else have their licenses revoked. If anyone sees motorcycles doing this on any French roads, pick up your mobile and call the police to report this illegal action. 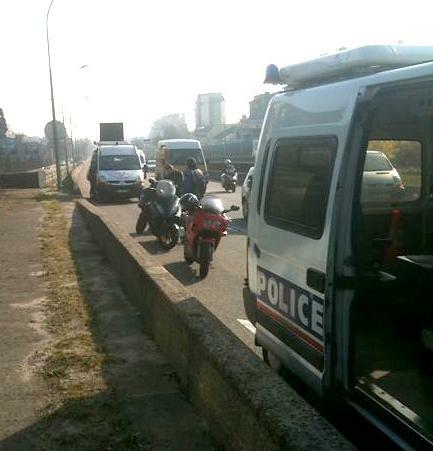 The French police should really come down hard on the motorcyclists who think that they are above the law. Let’s all join in and write to our lawmakers and police forces in order to step up this long-overdue crackdown on scofflaws who endanger all our lives. Would you rather be stuck behind a line of 10 motorcycles,or just let them through,easing the flow of traffic ……use your common sense.If you are in London city center all black cabs will move over to let bikes through to ease congestion. I would suggest that you have had a bad experience with a biker…..rather than thinking about the bigger picture.,If you were in a traffic jam and had 10 cars in front of you ,surely you would like them to move out of your way!…which would happen if they were bikes and could go down the center.